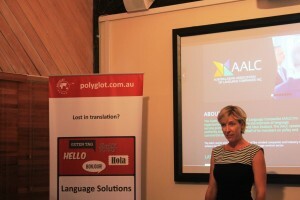 Polyglot hosted the first AALC event in the head office in Sydney on March 05, 2014. After welcoming words from Polyglot to distinguished peers and leaders of the industry in Australia & NZ, Tea Dietterich, AALC President, presented AALC’s vision, values and mission. AALC ‘s mission is to promote and defend the interests of LSPs (Language Service Providers – Translation and Interpreting companies). AALC has a vocation to promote & advance the important roles of language services and explore and develop industry best practices as well as promote fair competition between all language companies. AALC advocates for the interests of its members with other industry group representatives, the Commonwealth of Australia and NZ and other institutions as well as upholding and supporting the professional interests, status and rights of all associated members. The Event was a great success with impeccable timing a few weeks ahead of Globalisation and Localization (GALA) conference in Turkey later this month where AALC members will be the voice, eyes and ears of the LSP community in Australasia. Cultural Diversity Queensland is reviewing the current Queensland Government Language Services Policy, released in 2011. You are invited to have your say on the current Language Services Policy and provide feedback on how it can be improved to better meet the needs of culturally diverse Queenslanders with limited English proficiency to assist them to access the full range of Queensland Government and funded non-government services. The new Queensland Cultural Diversity Policy released in December 2013, identifies that a lack of English language proficiency can be a significant barrier to economic independence and participation within the community. A key priority of this new policy is a review of the Language Services Policy. If you wish to provide feedback on the current Languages Services Policy, please visit the Language Services Policy web page, complete the questionnaire and return it to Cultural Diversity Queensland by Monday 31 March 2014. It is expected that a new Language Service Policy will be finalised in mid-2014. Note from Wayne Briscoe, Executive Director, Cultural Diversity Queensland.